เลขที่บัญชี 022-1-79588-1 ธ.กสิกรไทย ชื่อบัญชี "บจก. เรคเรซ สปอร์ต"
เลขที่บัญชี 238-4-76618-0 ธ.กรุงเทพ ชื่อบัญชี "บจก. เรคเรซ สปอร์ต"
Wing Loei Mai 3 Chiang Khan Super Half Marathon 2019 Presented By Dutch Mill is coming back! Let's take on the scenery of Chiang Khan, one of the friendliest cities beside Mekong River which give you a warm welcome. Run among 100-year olds Thai house with an amazing culture "Tuk Bhat Khaw Neaw" and feel the sea of fog and ponorama sunrise over Pho Tok Mountain. Set your sights higher and challenge yourself at Chiang Khan Walking Street on 1 September 2019. 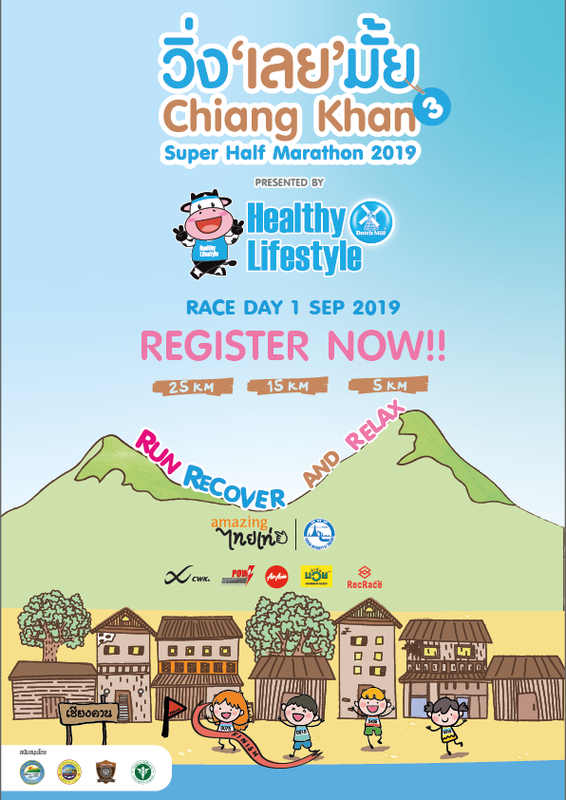 The first Super Half Marathon race in Chiang Khan, Loei will brings you on some of beautiful nature and great scenery of Chiang Khan local life. Route with a view of Mekong River, the world's 12th-longest river and Feel the sea of fog and sunrise over Pho Tok Mountain. - Fun Run 5 km. - Chip Timing for Super Half Marathon 25 km. / Super Mini Marathon 15 km. - Official finisher shirt for Super Half Marathon 25 km. -Official finisher buff for Super Mini Marathon 15 km. Race type : Super Half Marathon 25 km. / Super Mini Marathon 15 km. *** If you want direct mail delivery for shirt, pay 60 Bath extra. After you transfer the money, please report the money transfer on Rundidi.com.